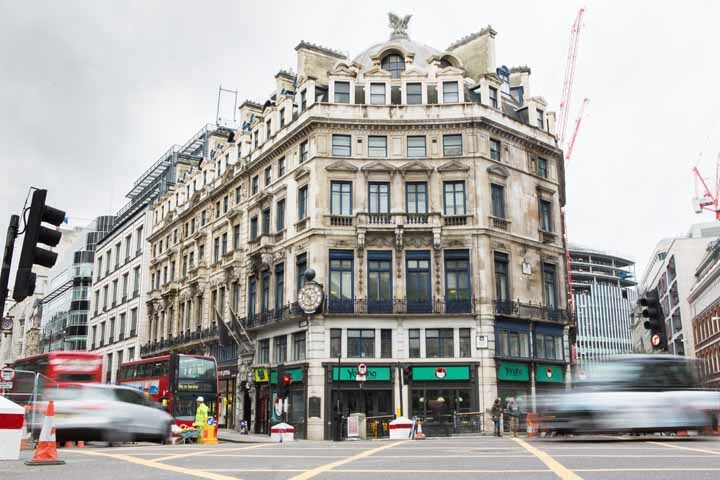 Find serviced office space to rent in world famous Fleet Street - the historic home of the British press. Photo credits: Wokit by Wokit; Garbanzos Hummus & Falafel Bar (Fleet Street) by Garbanzos Hummus & Falafel Bar (Fleet Street); Foomum by Foomum; The Tipperary by Chris Bedford; GRABTHAI Bangkok Café by Amal Ketata; Paul by Piotr Drozd; Pilpel by Jay Daniels; Wasabi Sushi & Bento by Pablo Costa Tirado; EAT. by EAT. ; Wrap It Up! by Piotr Drozd; Pret A Manger by Andrei Razin; Chilango by George Gaston; Chambers by Chambers; Dilieto Sandwich Bar by Michael Maule; El Vino Fleet Street by El Vino Fleet Street; Doughnut Time by Josh Rees; Vital Ingredient Fleet Street (Blackfriars) by Deepti Bhudia. Fleet Street is named after the River Fleet - the largest of London's subterranean rivers. London's first daily newspaper, the Daily Courant, was published in Fleet Street in March 1702.